In the world dominated by the “clash of civilizations” rhetoric and memories of bloody nationalist wars, nationalism is considered dangerous. However, the sentiment has become a highly positive phenomenon, and even, to an extent, a requirement at the international summer school “Belarus in the European Context: Current Discussions on Nation-Building,” organized by the Institute for Historical Research on Belarus and Philosophy Department of the European Humanities University (EHU) last week. Opening the school on August 2, Zahar Sybeka of Belarusian State Economic University said, tongue-in check, that all school participants were “nationalists.” The following six days proved him right as they showed their passion for the Belarusian culture and history and their concern about the country’s future. Fittingly, the school was held in “Kernavės Bajorynė”, next to the highly symbolic UNESCO World Heritage Site that has become a treasure trove for archeologists. 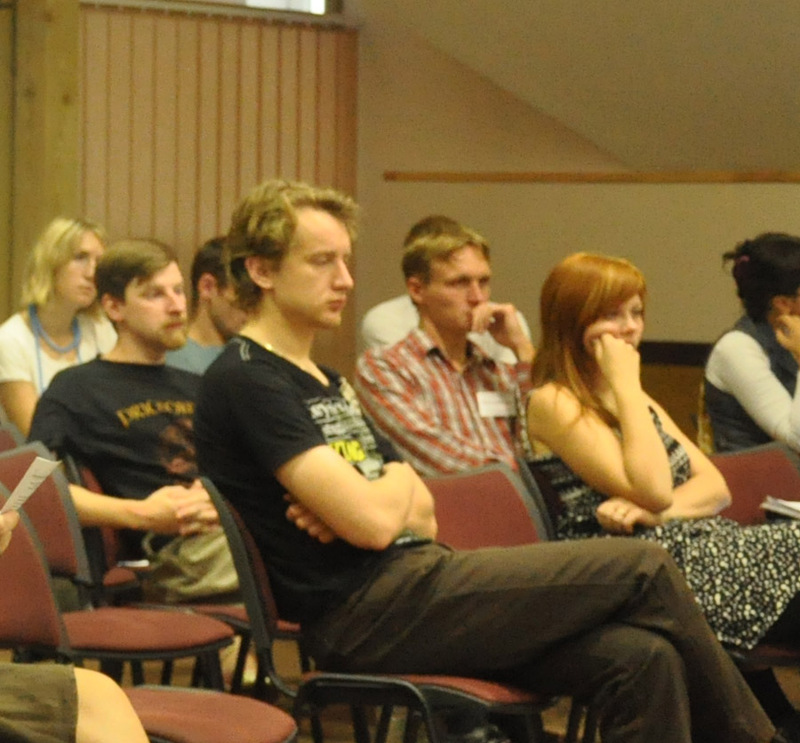 The event brought together intellectuals from Belarus, Poland, Latvia, Russia, and Lithuania to debate the development of Belarusian identity and the Belarusian national idea. The researchers also discussed the role of social groups in cities and villages, the role of history and memory in Belarus’ national identity, as well as the issues of nationalism, Europeization, and democratization. Although the school guests were divided into experts/tutors and participants, their roles have merged in heated discussions. Everybody had an opportunity to present and defend his/her work and comment on the others’ research. While historians and philosophers were the majority, the gathering also included political scientists, a journalist, and a jurist. 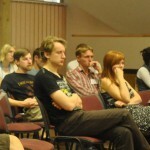 The schools represented at summer school included Belarusian State University (BSU), Harvard University, Metropolitan University Prague, Polish Academy of Sciences, European Humanities University, the National Academy of Sciences of Belarus, University of Bremen, Samara State University, Hrodna State University, Polotsk State University, and University of Latvia. Many interesting views were expressed during the school sessions. Olga Shparaga, EHU professor of philosophy, argued that for Belarusians “the question about the idea of Europe” is, first and foremost, a question about themselves. In contrast, University of Białystok professor Aleh Latyshonak said Belarusians lack “Europeanness.” While Latyshonak said he views Belarusians as a Eurasian civilization, he believes Belarus could pass a Byzantine civilization in a best-case scenario. In his turn, Belarusian philosopher and writer Ihar Babkou presented identity as a “battlefield” of power and knowledge. Interestingly, Valentin Akudovich, who teaches at the Belarusian Collegium, argued that Belarusian ethno nationalism has no future and will be very soon superceded by civic nationalism. In her presentation, Elena Temper of the University of Leipzig discussed the meaning of memory for the national self-identification and argued that the two most vivid examples of collective memory for Belarusians are the Great Patriotic War and Kurapaty. Other prominent participants included editor-in-chief of Belarusian magazine ARCHE Valer Bulgakau; Poland-based Belarusian historian Yauhen Miranovich; EHU lecturer Piotr Rudkouski; Hrodna State University professor Siarhei Tokts; Alvydas Nikzentaitis of Vilnius Pedagogical University; and EHU professor Ales Smalianchuk. At the final banquet, the school guests were united by signing Polish, Belarusian, Ukrainian, and Russian songs. The school materials will be published by the EHU in the fall, and the organizers hope to make the summer school an annual tradition. Listening to each other has allowed the researchers to share their views and learn from each other. As philosopher Alyaksei Dzermant summed up, the event has left the participants with an impression “that a lot more unites rather than divides” them. 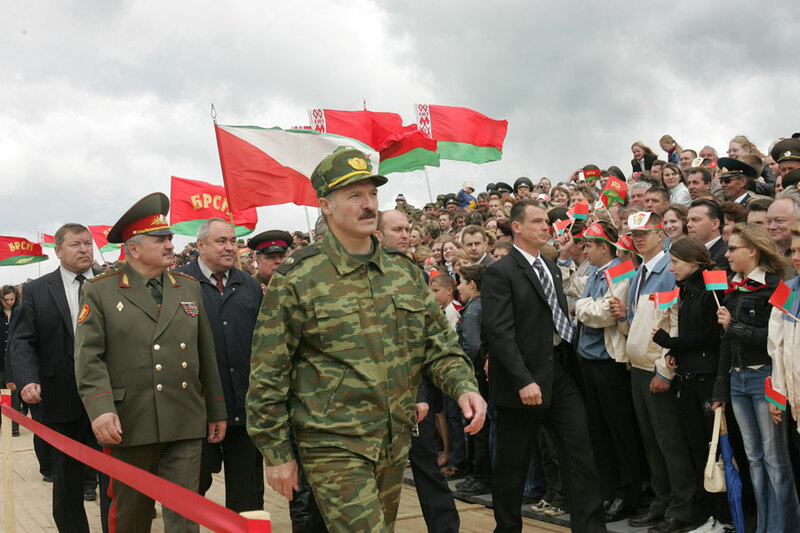 It is hard to say who will become Belarusian president after Lukashenka, but it is easy to predict what kind of political system will be left in Belarus. Although there was no massive violence, the authoritarian rule in Belarus has leveled the playing ground of Belarusian politics. Currently it looks more like a desert place with only primitive forms of political life. Belarusian people are unfamiliar with political pluralism and open debated in public sphere. Most people know nothing about political movements and politicians except for Lukashenka. The parties established after the Soviet Union collapse enjoyed a short period of relative freedom and since late 1990s they do not play the role which parties usually play in democratic societies. A period of prolonged inactivity has weakened their structures, activists, as well as resulted in impoverishment of their professional and political skills. The recent performance at the BBC’s ‘Hard Talk’ by an expected Belarusian presidential candidate demonstrated that if politicians stay for a while outside the public sphere it brings them no good. Speaking in London studio Mr. Andrei Sannikau stuck to old the motives of Belarusian opposition known from 1990s, which made him sound somehow anachronistic to those who follow events in Belarus. According to Sannikau, Lukashenka’s regime has not changed since 1996. Simply denying statistics on economic advances of the Belarusian regime, he proposed to compare Belarus not to Ukraine, but to Baltic states. This would be very misleading because Baltic countries have a very different history and are in many respects incomparable to Belarus. He boasted about stopping disappearances in 1999-2000 – actually there were 3 cases involving 4 persons, though Sannikau hinted that there were probably more disappearances and one murder – and only speculation on motives and other details. That is all. There are, however, many new things to sort out – the lack of modernization and degradation of infrastructure, deterioration of education and health system, murky deals with state property and much more. Indeed, Belarus is loosing its development prospects. Yet opposition is hotly discussing every new propaganda movie on Russian TV and flatly ignores that perhaps most valuable asset of national economy – potash company – can be sold to the Chinese behind closed doors dooming the nation to economic hardship for years. Of course, Lukashenka’s monopoly on politics exhausted and diminished not only Belarusian opposition. It also transformed the government itself into an amorphous mass of managers unable to work on their own. There seem to be quite few persons among regime’s servants who can become public politicians. The current Belarusian leader always promoted not politicians but ‘able functioners’ (‘khozyaystvenniki’) in his system. 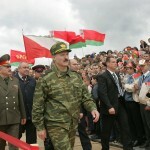 Even pro-president organizations established at some moment apparently in an attempt to provide a popular basis for regime and possibly serve as a source of new elites – like Belarusian Republican Youth Union or Public Association “Belaya Rus’” – could not persuade Lukashenka remained just some shabby institutions with colorless leaders. With some reservations, the Belarusian regime can be considered a ‘sultanistic’ because there is no real politics in the country outside the presidential palace. Under sultanistic regimes American scholar Richard Snyder means ‘the ruler’s maintenance of authority through personal patronage rather than through ideology, charisma or impersonal law’. Political scholars have already studied transformations of such regimes. And their predictions are gloomy. Sultanistic regimes have immense problems with transit to democratic government (comparing to authoritarian), and even if they manage to build some kind of democracy it displays many features of sultanism for many years ahead. However, only charismatic leaders with democratic beliefs usually manage to lead their nations from sultanism to democracy. It appears that Belarus currently has no politicians who would be charismatic enough. No wonder, some political analysts are exploring other scenarios of Belarusian political development in near future. Zmicier Pankaviec of ‘Nasha Niva’ gave up his hope for Democratic opposition and is seeking for a Lukashenka’s successor among regime’s ‘soft-liners’. It seems that the best exit-option for Lukashenka, Russia, West and opposition could be some kind of successor to the current president. For Lukashenka himself, as it is a guarantee of his own security. For Russian and Europe, since they get rid of an unreliable leader in a neighboring country. For opposition, because it would ensure some – however, little – democratic changes. I am sure, any new president after Lukashenka will be more democratic and will tilt toward the EU. He believes, Presidential Administration head Uladzimir Makiej can be a new president. If so, Belarusian leadership can reproduce the earlier political succession maneuvers of Vladimir Putin and Dmitri Medvedev in Russia. There are some signs – however scarce – that Lukashenka is thinking about a successor. Usually he implicitly and explicitly claimed himself to be indispensable and irreplaceable for the nation. But two years ago, while answering a question whether he is going to rule the country for the 4th term, he said that there are already people in the country who are able to run it, besides him. Of course, he did not elaborate on persons, yet anyway such statements are only available material to analyze Belarusian government politics extremely closed to any observers. Do not forget, so far Belarusian leader did not announce he would participate in the presidential elections due at the end of this year or in early 2011.